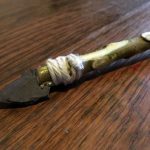 I’m often asked why it is so important for children to be introduced to the use of real tools at such a young and tender age. 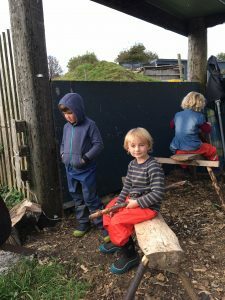 For many parents the thought of giving their 6 year old a hammer and saw to ‘play’ with seems destined for problems and causes a lot of concern and anxiety but the introduction of tool use in both nursery and outdoor play settings is on the increase and hears why. Tool use has been a defining element of human evolution for over 2 million years, with the use of simple stone tools to the development of axes and flint tools some 700,000 years ago. The development of tools can be seen to correlate directly with the development of language and behavioral developments such as technological, creative and symbolic thinking. We now know that humans are not the only species to have developed tool use, which can be seen in chimpanzees and other monkey species, elephants, dolphins and birds such as parrots and corvids. But we know that the extent that humans have evolved to use tools out numbers any other species as tools have become an integral part of our existence as we employ the use of tools on a regular basis to complete a vast and varied range of tasks. Our children are no different, from the moment they start to explore the world they are using tools for simple tasks in play, such as buckets and spades, pots and pans, spoons and forks, the list is endless. Yet as our children start to take bigger steps into the world we start to close down their opportunities to interact with and challenge themselves with new tools. By the time children reach primary school their main focus becomes academic learning and the use and exposure to tools takes a back seat. But by denying children the ability to experiment and play with such items are we in fact denying them the right tools to be successful in life? Tool use is a fantastic way for children to take some responsibility for their actions. 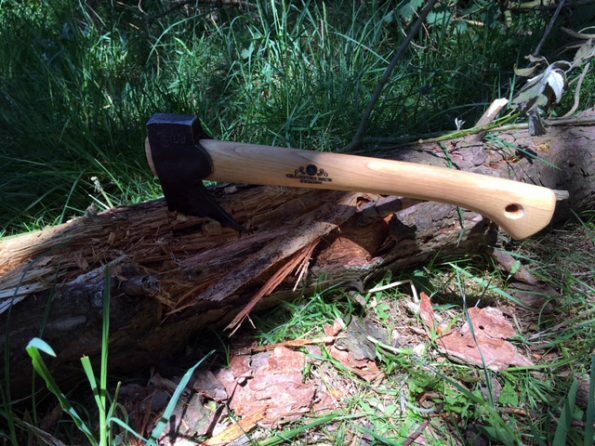 It soon becomes clear that if we mess about with a knife or an axe the consequences can be painful so children work hard to use the tools correctly and learn how to work with them. The sense of accomplishment once a child whittle’s their first stick, lights their first fire or saws their first piece of tree is also a great confidence booster. Plus, children also get a chance to progress their fine motor skills when using the specific pieces of equipment. As we move towards becoming a more sedentary nation our children’s ability to co-ordinate, balance and focus reduces and children are increasingly struggling with gross and fine motor skills development. Whilst schools try to increase options for physical movement within the school hours they do not have the time or the resources to address the whole problem and this is where introducing more tool use both at home and at extra curricular activities can help out. Tool Use In The Home…. We can all help by increasing our childrens exposure to tool use within our own homes. Create opportunities for children to use tools, involve children in jobs around the home finding suitable tasks that are within their realm of ability. Could they help to hang up pictures, hammer nails, use tools in the garden such as rakes, shovels, brushes and watering cans, even mowing the lawn under supervision. Can they take more responsibility in the kitchen with knives, whisks, graters and scissors? All tools that we use and take for granted in our every day lives but often avoid letting our children use for fear of accident or in an attempt to get the job done quicker. We’re all guilty of that moment when your child asks to help make the dinner and a voice inside screams NO! And maybe those moments aren’t the right moments, but make time for tools use, pencil in days to help with the garden, bake and cake and have a bedroom rearrange which involves some DIY tasks. Make these into activities and just as your child of 2 wanted to imitate Mummy stirring in the kitchen, your child of 8 will relish modelling themselves on you as you attempt to build a sandpit together. We can further enhance our children’s exposure to tools through normalising tool use in nurseries, after school clubs, schools and child care establishments. 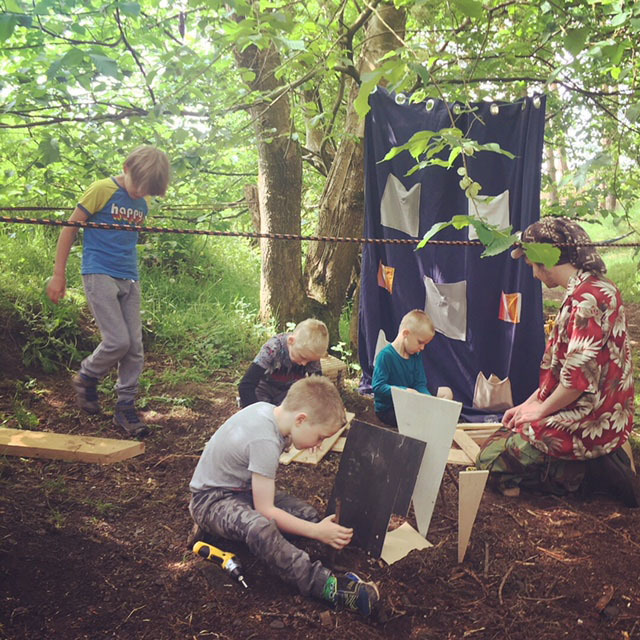 This is where the forest school model can be of influence with its regular use of tools to help children manipulate natural materials within sessions. 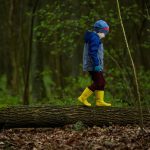 Forest school promotes the use of tools for a range of reasons. It recognises the importance of tool use in a child’s motor skills and movement development, the increased hand and eye co-ordination and the ability to focus. It also recognises the development and strengthening of the leader/child relationship by entering into a tool related task that is completed with support and supervision. It encourages the introduction of risk into a child’s learning experiences knowing that without risk a child can not learn risk assessment, boundaries and the importance of taking responsibility for your own actions. If you hammer your finger….it’s sore! And perhaps the most noticeable of all the outcomes is the increase in confidence and sense of achievement that a child can find from successfully completing a task using a tool for the first time. It is a small step into the adult world completed and they brim with pride when completed. 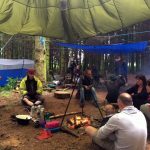 Forest school leaders know how to support this process through gentle support and direction. We also recognise the need for children to experiment with a variety of tools in their own time without a specific task or item to make. This is often an overlooked area with parents often keen to see a ‘finished item’, or evidence of what they have built in adult terms. 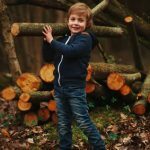 For children the process of creation is far more important and worthy of their time and the finished product can often look a mess to an over seeing adult but a child see’s something very different in that pile of hammered together wood that they have been working on. It is these ‘lesser spotted’ projects that we must also recognise and praise when our children want to show us what they have completed, such as the teddy house, the guinea pig run, the shop, the vets clinic….all wonderful insights into our childs world of play and experimentation that we may not fully understand or see but our children are equally proud of if not more to the mallet they made last week under supervision. In order to give children the opportunity to fully explore and freely use tools we have recently introduced a ‘Tool Zone’ throughout some of our sessions. This is a designated area where children are provided with a range of tools and materials for them to use, build, hammer, nail, screw, balance together and the results have been fantastic. We are finding that children are spending hours in the Tool Zone deeply immersed in their own creative process making an item completely of their own design. This is possibly one of the most rewarding area’s we have introduced so far into the sessions and one we will be developing further as we see the benefits and the learning experiences the children are gaining from it. Things To Remember When Using Tools With Children…. The quality of tools is paramount. More accidents happen with blunt or inferior tools as children become frustrated with the tools inability to do the job they had in mind. Always use the best quality tools that you have. Take the time to demonstrate the tool fully explaining the safe use positions and the risks that the tool poses. Try to maintain a healthy balance between supervision and free experimentation. It is very easy to micromanage a situation with children but this can be counterproductive for the child making them feel incompetent and having a negative effect on their confidence. Aim for success! Choose projects that are easy to complete and tools that are relatively easy to use initially before moving onto more complex projects. You don’t want a half finished woodwork project left sitting as a stark reminder of how difficult it was to complete. This can lead to creating a barrier to entering into possible projects in the future. And most of all enjoy it! If its causing anxiety and tension between yourselves its not meeting its objectives so breathe deep, relax and remember that the finished item does not have to be perfect! 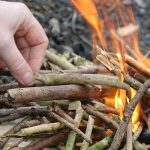 The use of simple tools in play is now being widely recognised as a valuable learning experience for all ages of children. It provides real life experiences that help to gain real life skills and it can be incredibly fun too. 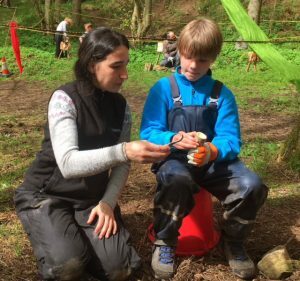 If you feel your child would benefit from exposure to tool use in a variety of settings speak to your local forest school provider about the opportunities they may be able to offer and look at simple ways to introduce tool use around the home.